← Matt Black vs Traffic, wasps and of course a flock of geese. Alleged iPhone 5 photos are leaking out of China faster than our judicial system puts people on probation. These new iPhone 5 photos show what appears to be a detailed, but solid iPhone 5 sample or model likely used to test accessories or refine the manufacturing process, even though it is highly dependent on hand assembly. Are these real pictures? Did a leak get the right info? We will have to wait another month (August Rumor release date) to find out for sure, but let’s talk about the leak, and hope some of its true. 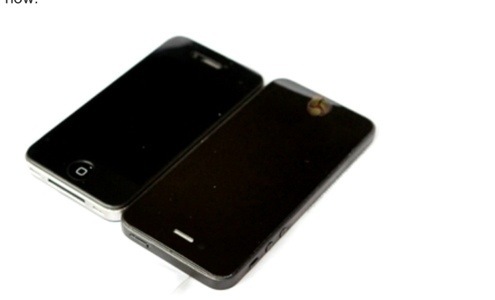 The leaked iPhone 5 photos show the taller iPhone 5 next to an iPhone 4S for size comparison, and include the now familiar two-part back design which may accommodate a metal back as part of an iPhone 5 design. A larger retina screen disply seems like a good possibility, with a redesign charging port, which for some reason upsets me beyond anything imaginable. This photo also shows the new iPhone may be thinner than the iPhone 4S, which is a no brainer….they had to! people want thinner and more light weight. From the looks of different leak sites about the new iPhone, and the IPad mini, which is rumored to be revealed at same time as iPhone 5, we are in for some treats. The iPhone should have the following specs. Slightly taller and slightly thinner, but the same width. A Quad-Core processor, possibly the Apple A6 processor. Partial metal back, which could play a part in a better antenna design. I can’t leave out the all new IOS 6 rumored features that are suiting in themselves..
iOS 6 is going to be coming with over 200 features including a big update to the software’s virtual personal assistant, Siri. The virtual assistant, which as been out for 8 months. Siri has been loaded up with an ability to look at sports scores, something that has been rumored for quite some time. Apple even showed that Siri can let users know whether a basketball player is taller or shorter than the other. That’s how specific it can get. Users can check standings and even see when teams are playing. New sports features were a must! The personal assistant can also make restaurant reservations through OpenTable, it can bring up movie trailers, times and reviews using Rotten Tomatoes, and it can open applications when users ask it to. Apple showed off Siri opening up Temple Run. Siri can now tweet to Twitter, using voice commands only, and help you with status updates! Apple has also partnered with several automobile manufacturers to offer Hands-Free Siri access when in the car. Siri also now features support for quite a few new languages. As expected, Siri will be coming to the iPad at some point in the future. With iOS 5, Apple included Twitter integration. With iOS 6, Apple will be including deep Facebook integration that will allow users to post to Facebook, post photos to Facebook and pull up Facebook notifications in Notification Center. Facebook will also be integrated with Siri which means users will be able to use voice commands to update Facebook. iOS 6 will also deliver a phone application where users can slide up to either reply to a phone call with a message or set up a reminder to call the person back later. Apple has also added a Do Not Disturb feature to iOS 6 which will allow users to easily silence their phone. The company has also included a long-awaited feature in FaceTime over 3G which will allow iOS users to make FaceTime calls when Wi-Fi is not available. iOS 6 will add shared photo streams and users will now be able to quickly share photos with friends and family. The software will bring VIP Inbox which will let users select important peoples emails whose emails will appear on the lock screen. Apple has also added a pull to refresh feature. Apple has added PassBook which will let users store boarding passes for flights and movie tickets in the app. Specifically, Apple showed off United and Starbucks. Apple has also shown off its new Maps application, something that was heavily rumored ahead of WWDC 2012. Apple is adding the Maps application to iOS 6 and it will add important places of interest, 3D maps, Yelp integration, traffic service and turn by turn navigation. This means a good farewell to gps devices in car. Your iPhone will b your new gps! Essentially, Apple has added everything that users have been clamoring for for quite some time now. With 200 new features, which I have already discussed a few, let’s look at this great top 40 list. 1. FaceTime over 3G and 4G – Make FaceTime calls over cellular connections. 2. Facebook Integration – Share photos to Facebook from Photos app and Like Apps. 3. Calls – Slide to answer a call or slide up to reply with a message & remind you to call back later. 4. Passbook – Your digital wallet for loyalty cards, Amtrak, United, hotel reservations and more. 5. Lost Mode – Send a phone number to whoever found your lost iPhone to get a call. 7. Open Apps with Siri – Siri can now open apps with your voice. 8. VIP Inbox – Tell Mail who your important contacts are so you never miss an email. 9. Siri – Check sports scores, movie times and make restaurant reservations. Instant Sharing to Facebook and Twitter – Notification Center lets you share direct to Facebook and Twitter. 10. Better Sharing Menu – When Sharing, you’ll see a new icon driven sharing menu. 11. Autocorrection for Every Keyboard – Support for autocorrect while using external Bluetooth keyboards. 12. Location Based Reminders for iPad – The iPad will no support reminders based on location, may be limited to cellular models. 13. Manual Location Entry for Reminders – No longer need GPS to set a location reminder, 13. type in an address. 14. VoiceOver Improvements – Better accessibility features from VoiceOver for visually impaired users. 15. Personal Dictionary in the Cloud – sync personalized spellings and autocorrections of names across iPhone and iPad. 16. Do Not Disturb – Set the iPhone to prevent calls and notifications from waking you at night, but still allow special callers. 17. Per Account Signatures in Mail – One signature for work email, one for personal. 18. Game Center Challenges – Brag about your high score and issue challenges to friends. 19. Game Center Friends from Facebook – Pull your Facebook friends into games. 20. Manual Reorder of Reminders – Change the order of reminders to match your priorities. 21. Improved Privacy Controls – More granular control over your personal data. Turn location control off by app. 22. Custom Vibrations for Alerts – Already available in iOS 5, expect new features. 24. Video stabilization : Stabilizes iPhone and iPad video, which are often shaky. 25. Shared Photostreams- Make and share albums in PhotoStream. Easily share the right photos with specific friends and family members in near real-time. Also includes comments and notifications. 26. App in Safari Search Results – See app store search results in the Safari search results. 27. Full Screen Landscape Support in Safari – See more of the web while browsing in landscape on the iPhone. 29. HDR Improvements – Better performance and results for HDR photo taking. 30. Made for iPhone Hearing Aids – Apple certified hearing aids that will work specifically with the iPhone and iPad. 31. Improved Accessibility Controls – Lock settings and lock the home button to keep kids out of settings they don’t need to touch. 32. French, German and Spanish Dictionaries – Multiple language dictionaries now in iOS 6. 33. Alarm with Song – Wake up with your favorite music in iOS 6. 34. Redesigned Stores – Better looking mobile stores with Coverflow. 38. Safari Browser Syncing – Continue browsing sessions on the iPad after starting in your computer or the iPhone. 39. Maps- New maps with traffic and 3D flyover mode. 40. The IPhone 5 and iPad mini will be released! iOS 6 will arrive this fall with the iPhone 5. The iOS 6 beta is available today for users willing to pay for a chance to try the latest Apple software. iOS 6 will be coming to the iPhone 3GS and above for iPhone, iPad 2 and iPad 3, and the iPod touch 4th generation. It will be out sometime later this year, sometime between August and October. With all the new features, it seems to be a big hit and I personally can not wait! Posted on July 14, 2012, in Matt Black vs The WORLD and tagged Apple, bill gates, iOS 6, iPad, iPad 2, iPad 3, iPhone, mac, MacBook, mini iPad, phone 5, Steve jobs. Bookmark the permalink. Leave a comment.